As government, business and civil society leaders review the world’s progress on sustainable development at the United Nations in New York, a 12 July 2018 event, convened by the Permanent Mission of Costa Rica, zeroed in on food safety and the vital role of Codex standards. Codex Alimentarius Commission Officers, Members and Observers called for strengthening food safety efforts during “Safe Food for Sustainable and Resilient Societies”, a side event of the High-Level Political Forum on Sustainable Development. “This is a topic that cuts right across the 2030 Agenda,” said Werner Obermeyer, Deputy Executive Director of the World Health Organization, in opening the event as moderator. “It is also an area where the One Health approach has been practised for decades,” he said, underscoring that 420 000 people die every year from food safety lapses, one-third of which are children under five. With the support of all of you, we aim to celebrate 7 June of 2019 as our first World Food Safety Day. Ambassador Marco Vinicio Vargas (photo, left), Permanent Mission of Costa Rica to FAO, substantiated the need for food safety with health, environmental and economic concerns. “With the support of all of you, we aim to celebrate 7 June of 2019 as our first World Food Safety Day,” he said, announcing his delegation’s intention to bring a resolution to the 73rd session of the General Assembly of the United Nations, and ultimately more political and public attention to importance of safe food. “Ensuring food safety should be a priority in all parts of the world,” said Awilo Ochieng Pernet, former Chairperson of the Codex Alimentarius Commission, who welcomed the proposal of proclaiming a World Food Safety Day. Her remarks centred on the strong linkages between food safety, a prerequisite to food and nutrition security, and several of the Sustainable Development Goals. “The Codex Alimentarius Commission ensures the global governance of food safety, quality and nutrition through the development of internationally harmonized science-based standards,” she said. Among the Sustainable Development Goals (SDGs) that Codex contributes to, Mary Frances Lowe, Director of the U.S. Codex Office, emphasized the one on partnerships. “Codex is an extraordinary example of partnership with its core values of transparency, inclusiveness, collaboration and consensus building, which are demonstrated in every meeting,” she said. She explained that governments alone cannot ensure food safety as it is a shared responsibility and that Codex standards can be considered tools that help countries deliver on the SDGs. Atze Schaap of Friesland Campina, a member of the International Dairy Federation, spoke from the perspective of a producer of a perishable and vulnerable commodity: milk. Calling the cross-cutting nature of food safety ‘an opportunity’, he underscored the multiple drivers to make progress. His vision of ‘food that is safe and of high quality; food that is nutritious; less food waste; lower carbon footprint; and better livelihoods for farmers and producers’ can be realized by organizing the production chain efficiently with a focus on the end consumer, he explained. Consumers International was represented by Sana Mujahid of Consumer Reports, who revealed the correlation between food safety and sustainability found in some of the research her non-profit organization conducts. “We noted that cattle raised on pasture with grass-based diets live better lives and also led to better outcomes for the planet, and healthier meat for consumers,” she said, referring to lower overall bacteria prevalence in more sustainably produced beef. 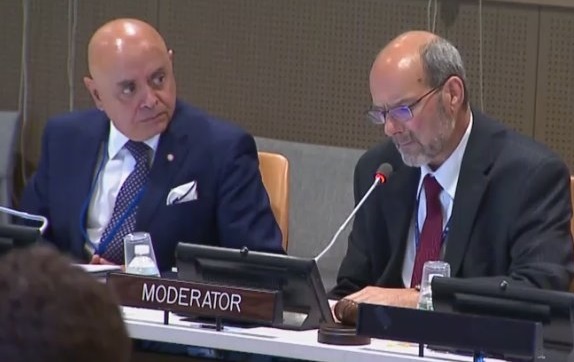 Guilherme Antonio da Costa, Chairperson Codex Alimentarius Commission, outlined the benefits of Codex standards to help manage food safety risks, protect the health of consumers and facilitate international trade. “To guarantee fair practices in the food trade, to make these [Codex] standards practicable and to implement the SDGs, we need to change,” he said, inviting the public and private sectors to break paradigms. Participants raised issues such as industries using blockchain technology in food safety and the essential role of Codex standards in food and nutrition security. The resounding message stemming from the side event: food safety is a shared responsibility with everyone across the food chain – from production to consumption. Truly an issue deserving of an annual international observance.